KIEV, Ukraine -- Two Ukrainian opposition parties whose leaders are currently in jail say they will form a joint candidate list for the 2012 parliamentary elections, RFE/RL's Ukrainian Service reports. 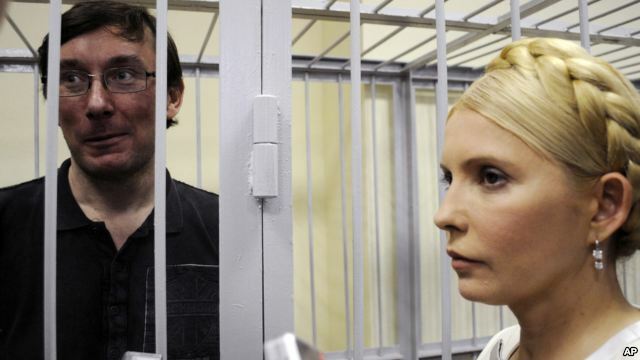 Yuriy Lutsenko (L) and Yulia Tymoshenko meet in a courtroom in Kiev in May. The deputy leaders of the Fatherland and People's Self-Defense parties made the announcement in Kiev. Former Ukrainian Prime Minister and Fatherland party leader Yulia Tymoshenko was jailed in October for seven years for exceeding her authority in brokering a 2009 gas deal with Russia. And former Interior Minister and head of the People's Self-Defense party Yuriy Lutsenko went on trial in May for abuse of office and misappropriation of funds. He remains in detention. Both deny the charges against them and say their cases are politically motivated. The two deputy leaders said on December 28 that their parties will merge at a still undetermined date. The elections to the unicameral parliament are scheduled for October. President Viktor Yanukovych's Party of Regions currently holds a majority in parliament. Yanukovych narrowly beat Tymoshenko in the 2010 presidential election, 48.95 percent to 45.47 percent. According to a poll by the Kyiv-based Razumkov Center released on December 27, Fatherland is currently the most popular party in Ukraine with 15.8 percent support, while People's Self-Defense garnered just 0.4 percent support from respondents. The first deputy leader of Fatherland, Oleksandr Turchynov, expressed the hope that some other opposition parties will also merge with his party and People's Self-Defense. Ukraine earlier this year switched to a mixed electoral system, with half of the deputies to be elected under the proportional system.